At the beginning of 1918, 2nd and 9th Battalions of the Gloucestershire Regiment had already been in Salonika and Macedonia for two years. The Front had been largely static, with the Allied presence serving to support Serbia and threaten Bulgaria. Resources had never been enough for a major offensive to be mounted during this period, and disease was a greater enemy than the Bulgarians. Private Frank Peck of 9th Battalion was at one time posted as a signaller to Army Headquarters in Salonika and got a good view of his Serbian allies. Later in the summer of 1916 Peck found himself back with 9th Battalion on the front line. Frank Peck was well enough to be selected for a night patrol a little later, during which he was shot and wounded in the foot. He was eventually sent back to England where he recovered. 9th Battalion left the Salonika Front for France in the summer of 1918. “14th July 1917. – French having a ‘beano’ today. Something to do with the Bastille. Awfully warm. . . . there is no news at all except that Colonel Burges turned up today. I was awfully glad to see him. I think he was looking a good deal thinner than when I saw him last. We are still doing a very nice course of rabbits. We liked them awfully for the first 3 days and then rabbits twice a day for a week began to be just a bit wearisome. They have begun again now. The small cats love them. That is an advantage. Their chief diet seems to be grasshoppers. “Up to now the Battalion had received comparatively few casualties, but at this point the enemy concentrated his artillery fire on his lost position, the chief cause of discomfort being the enemy’s trench mortars. The ground was hard sandstone, rendering consolidation difficult and causing splinters of rock to fly from H.E. shells and dense clouds of dust. “Under these conditions the difficulties of maintaining communications were almost insuperable and added to this the whole of battalion headquarters personnel, with the exception of the C.O. and Adjutant, had been killed or wounded during the early stages of the attack. The bombardment of Roche Noire continued over the next two days, and another serious but unsuccessful attempt to retake Roche Noire was made by the Bulgarians, but the Gloucesters held on. Hostilities with Bulgaria came to an end on 30th September. “. . . We are still in the mountains. The weather has been alternately hot and cold for the past 10 days or so. Down on the plains we had it very hot up here – it must have been boiling. The British troops out here are gradually getting issued with khaki drill and pith helmets. Our battalion will be getting them shortly I expect. We shall then have three different kinds of headgear, pith helmets, shrapnel helmets and soft service caps. “. . . One thing – three cheers the war’s practically over – bar shouting. There won’t half be a celebration when I come home. I hope Dad won’t get alarmed to hear this. 1/6th Battalion arrived home in Bristol on 25th March 1920. 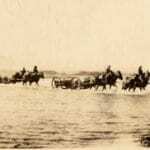 Picture: Transport of 2nd Battalion crossing the Varda River, Macedonia 1918.